Wesco's 16 inch, black Highliner put the company on the map as one of America's finest leather boot makers. Originally made for professional linemen, tree service workers, and cable installers, these climbing boots will stand you in good stead as their 16 inch height will protect both your feet and calves. Whether you are climbing trees or electrical poles, you can rest easy knowing that 7 ounces of full-grain leather separates your feet from the harsh terrain around you. In combination with all these features, these boots also come equipped with a steel shank, which helps your foot better bear the load that climbing puts on your feet. Ankle and foot injuries will be a thing of the past! 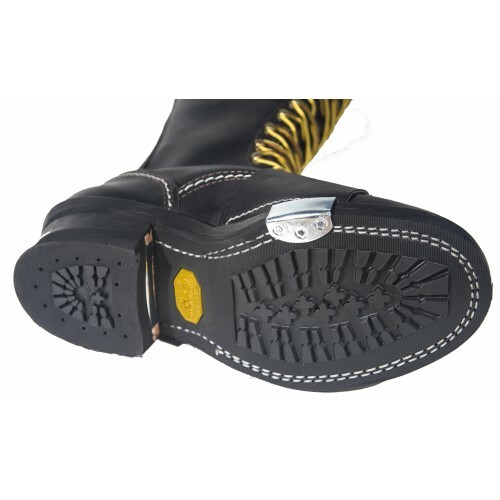 With climbing being a hazardous occupation, Wesco added in a recessed metal heel breastplate to the Highliner. This feature is the savior of a lot of workers, as it offers protection from climbing spurs. A 430 Vibram sole also comes in handy when you are traversing those treacherous poles and mountains. Designed with your safety in mind, these work boots are a must have for those of you in the industry and hobby of climbing. 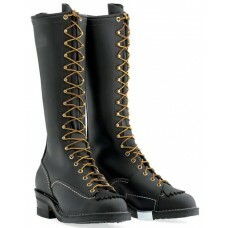 If 16" inches is too tall for your liking, check out our 10" Highliner boot!